Men’s hairstyles can be very different from women’s, which is why it’s important to use the right product. If you’re looking for something to hold your pompadour in place or just want to find the best hair thickening spray for men, you’re in the right place. We researched some of the best men’s hair sprays available to help you find the right one for your ‘do. Before we get started, let’s take a quick look at some key features. Package Size: These products all run from about 6 to 10 ounces, which seems like a pretty big range. Consider this, though. Aerosols have a little more volume than pumps because of how they’re formulated and different packaging needs. Pieces: Some of these products come in multipacks of 3 or 4 bottles. The benefit is that you won’t run out as quickly because you’ll have a spare bottle or two ready to go when the one you’re using is empty. Scented: It’s important to note that just because a product is not scented doesn’t mean it doesn’t smell. Most hairsprays have some scent to them while others have added ingredients to make them smell more perfumey or manly. Type: There are 2 types of hairspray included in this list: aerosol and pump. They’re actually quite different. Aerosols deliver a finer, more evenly distributed mist while pumps are great for more intricate, focused styling, especially curly hair. Hold: Hold varies from flexible to stiff. Which one is best for you depends on the look you’re going for. If you want something to hold a mohawk, obviously, go for stiff. For something more natural, go for flexible. Shine - There’s a lot of variety when it comes to shine. Matte or low shine finishes usually look like you’re not using any product at all. High shine formulas give your hair a glossier, more defined look. Now that you know a little more about the specifics, let’s take a look at our top products. Here’s how it works. If you’re in a hurry, don’t worry. We put our top and budget picks at the beginning of the list so you can get some idea of the variety that’s available. Stick around if you can, though, these products are all unique and cater to different hair types, textures, and styles. Okay, let’s get right to it. 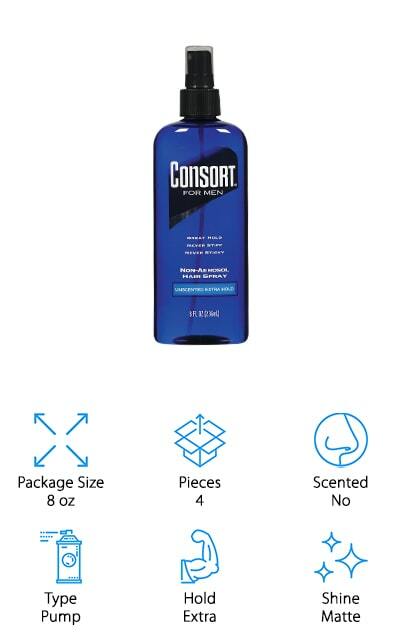 Consort Hair Spray for Men is our top pick for best hair styling spray for men. This is their extra hold formula and it perfect for guys who want to get their look right without having to spend a lot of extra time fussing over their hair. The formula is also a great hairspray for men with fine hair. Why do we say that? It’s lightweight and won’t weigh down your hair which creates a fuller, thicker look. Another great thing about this product is it’s never stiff or sticky. It provides a 12-hour natural hold that keeps your style in place without giving you helmet head. t feels natural while still keeping your hair in place when the wind blows. One more thing, there’s no flowery or intrusive scent. Next up is our budget pick for hair styling spray for men, American Crew Spray Gel. This is a great choice for men looking for something that provides a little more control when styling. It’s alcohol-free plus includes aloe vera so it won’t dry out your hair or scalp. That’s not all, it even has a bit of sun protection in it to keep your hair safe from damaging UV rays. This is a great product if you blow dry your hair. Spray it in and it really helps you set your style while you dry. It’s great for dry hair, too, with a firm but flexible hold. It goes on wet and, while it dries with medium shine, simply running a comb or brush through it will give it a dry finish while maintaining your style. 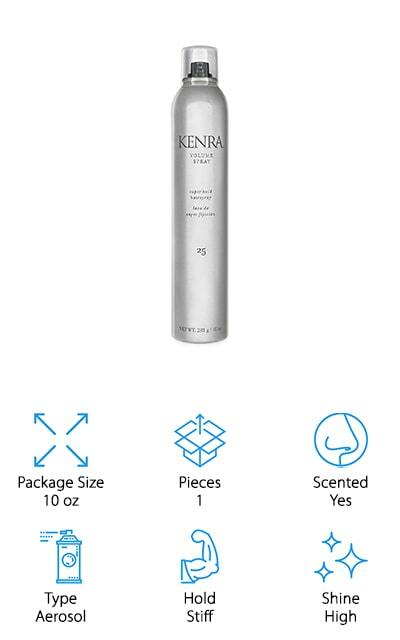 If you’re looking for a good hairspray for men with thin hair, Kenra Volume Spray is a great choice. Not only does it provide excellent hold, but it also adds volume and lift, too. 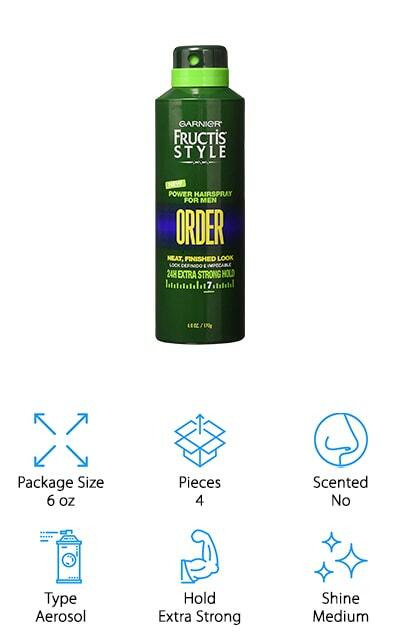 This spray is stiff but still workable in your hair. It goes on wet and dries a little hard but if you brush it out, it’s much more natural looking and still keeps your style in place. It’s quick drying and resistant to wind up to 25 miles per hour. And get this, according to the brand, it has 120-hour hold and can every resist high humidity for up to 20 hours. If you have thinning hair, it’s not always easy to get the style just right. This spray not only helps get the look you want, it helps you keep it for the whole day. 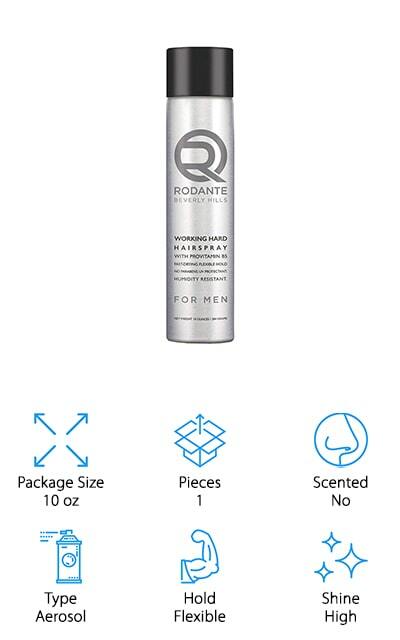 Another good hairspray for men is this formula from Rodante Beverly Hills. This one is salon-quality and dries quickly which helps prevent any stiffness or stickiness. One of the reasons it’s able to do this is because of the micro-fine mist. It adds a nice shine while also providing long-lasting control. Here’s the thing, it does it while remaining flexible! Even hard to retain hairstyles stay soft, brushable, and smooth to the touch. This is a great choice for any hair type and won’t cause any dulling, flaking, or buildup but it’s ideal for longer hair that needs spray to hold the style while still having the freedom to move naturally. That’s not all, it can also help create volume. Just spray a few quick bursts while blow drying and you’ll see a difference. TIGI Bed Head is a pretty popular brand when it comes to styling products. 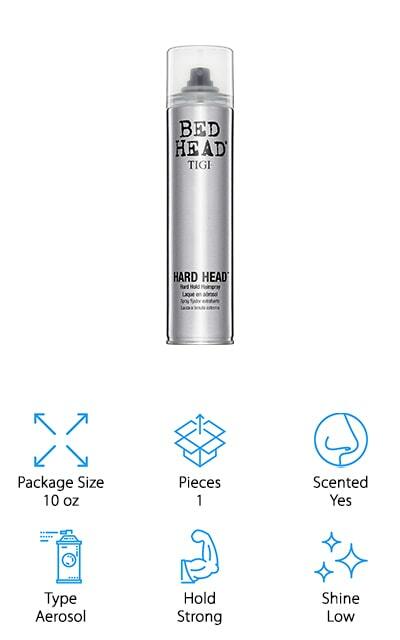 Their Hard Head Hair Spray is definitely some of the best hairspray for men who are looking for a lot of hold. What do we mean? For one thing, it holds up in hot, humid weather well. So, if you need some help making your everyday style last, you’ve got it. Plus, if you need something to hold extreme spikes or mohawks in place all day, this will do it. Despite how strong it is, it isn’t sticky and can be brushed out pretty easily if needed. Use a little for all-day hold for more mainstream styles and a little more for extreme styles. That way, you’ll get hold that lasts all day without dulling your hair. Next up is Sebastian Shaper Hairspray, a great choice for hard to control hair. The ultra-firm hold helps you keep your style exactly where you want it. This is a good product for thick or coarse hair and can really help set styles that have a lot of shape. So, if you’re rocking a spiky look, a hard side part, pompadour, or just want to add a lot of texture, this is a great choice. It does the job without any stickiness. That’s not all, even though it holds firm, it’s not stiff, so it’s great for tamer styles and keeps your hair looking good even on rainy or windy days. The aerosol spray covers evenly and makes styling easier. One more thing, while it does have a slight scent, it’s pleasant and not overpowering. 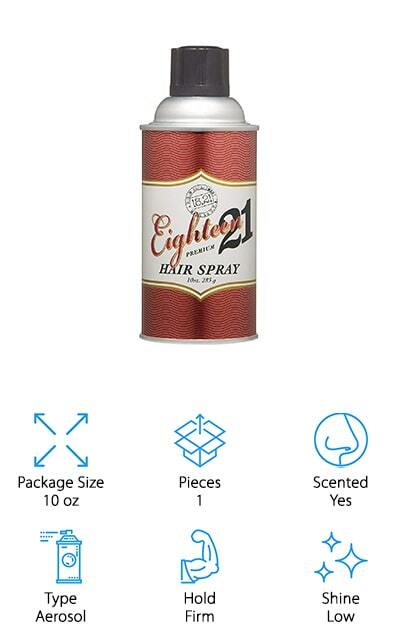 Our next choice for hairspray for men's hair is 18.21 Man Made Hair Spray. This is a fast-drying formula that gives you flexible hold with low shine. It’s not only great for controlling style, but it’s also a great way to get a lot of texture. The hold lasts all day and protects from the frizz that occurs with humid weather that ruins your style. It comes out of the can in a fine mist for even coverage. That’s not all, it’s brushable and washes out easily. Plus, it won’t flake and doesn’t leave hair looking greasy. One more thing, the packaging looks pretty awesome. 18.21 is inspired by the 18th Amendment and prohibition. So, get this, the can is modeled to look and feel like a beer can from the early 1900s. 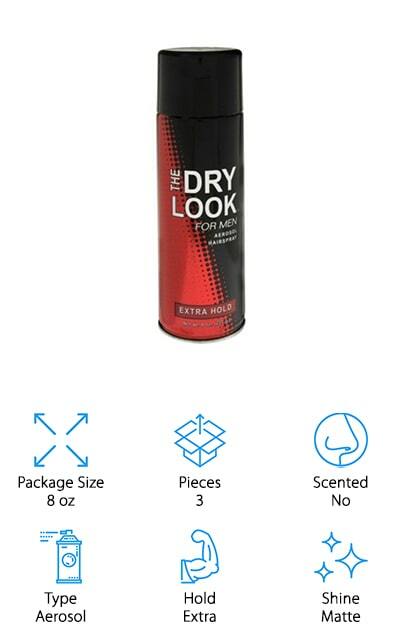 Dry Look Hairspray is a perfect choice for men who want, well, a dry look. This product doesn’t have any shine at all. In fact, it really makes your hair look like you’re not using any product even though it actually delivers a stronghold that works on even thinning or fine hair. Get this, it lasts up to 12 hours and provides a sturdy hold that keeps even the worst flyaways in place. It won’t make your hair too hard and never looks greasy. The aerosol spray creates a fine mist that’s easy to apply and distributes the product lightly and evenly through your hair for quick and efficient styling. Flaking is minimal, too. Each can holds 8 ounces of product and, because this item includes 3 cans, it will last a pretty long time. The next item on our list is Garnier Fructis Power Hairspray, a powerful formula with extra strong hold that lasts up to 24 hours. It’s quick drying and instantly locks your hair in place to help keep your style neat and tidy without any stiffness. The aerosol mist comes out smooth and goes on evenly for consistent results and easy styling. It even resists humidity to keep your perfect style in place when you walk out the door on a hot summer day. That’s not all. It isn’t sticky, either, and won’t leave behind any residue. If you want something that gives a little shine to your hair without looking greasy or stiff, this one is a great choice. It provides natural looking shine that leaves your hair looking healthy without any dullness. 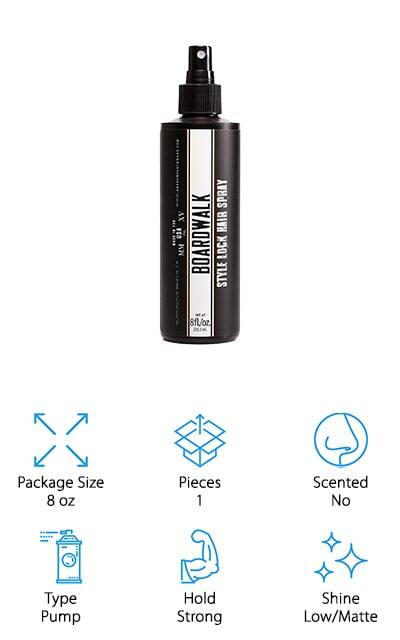 Our last pick for best men hairspray is Boardwalk Style Lock. This is a great option for anyone who suffers from breakouts or dandruff because it’s formulated with aloe vera and leaves out CFCs, parabens, and ethanol. If you have an itchy scalp and have found that some products just make it even worse, give this one a try. Even though it’s gentle on your hair and skin, it still works like a charm. The strong hold lasts all day and gives your hair a low shine, matte finish that makes it look like you’re not using any product at all. It makes it really easy to style your hair and washes out easily, too. This is also one of our picks for the best hairspray for balding men since it won’t cause any scalp irritation.